When it comes to advertising your company, there are many creative options that you can explore. One option that helps to get your company name and image out to the public while also serving a useful purpose is the use of advertising trash and recycling cans. At Securr, we offer a number of excellent options for businesses that are interested in pursuing this option. Here is a look at the options from which you can choose. Other features include a side-opening service door and full-length piano hinge for added durability. Aside from differences in capacity, these various models offer some slight differences. For example, the 36-gallon VL360W-ADVERT has a slim profile that is specifically designed to be used in tight areas. As part of the ValueLine Series, this receptacle is made from durable, corrosion-resistant products while keeping affordability in mind. 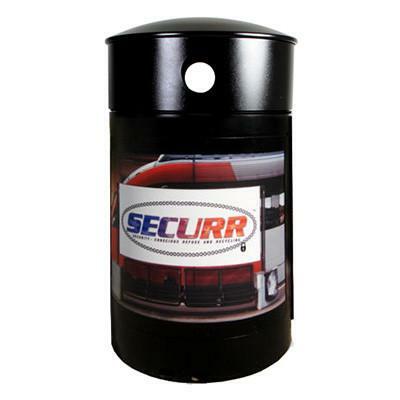 With this model, the advertisement is placed on the front of the receptacle. Meanwhile, both the HS45OR-ADVERT and HS45OW-ADVERT are part of the Sentinel Series of trash cans. While both models are made from heavy-guage galvannealed steel frames, the OR model features interchangeable side panels that are bolted into place while the OW model uses ad frames to accommodate ad panels measuring anywhere from .040 to .090 thick. The 40-gallon AC40OW-ADVERT is also part of the Sentinel features and offers the same features as the 36-gallon HS45OR-ADVERT. The unit is sold with or without ad panels. Meanwhile, a hinged top offers easy access to the contents. The two 64-gallon models are different in that the AC640W-ADVERT model features a bag frame with a hinged top. Designed to accommodate styrene ad panels measuring 22” x 35”, the viewable area on this advertising receptacle is 20” x 32”. The HS64-ADVERT model, on the other hand, has side opening doors for waste removal and is configured to accommodate full-sized ad panel frames on the front and rear of the base measuring between .040 and .090 thick. 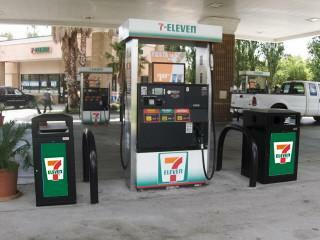 All three of these advertising receptacles include full-sized ad panels frames on the front and rear of the base.